I adore this Amla Hair Oil. It is very diverse but I usually find that I apply it about an hour before I shower or bathe. The lemon scent is very uplifting and I think it helps a lot on days when I'm feeling low. Lemon essential oil actually has antidepressant properties as well as a whole host of others. This product is so simple as it only contains 5 natural ingredients. As mentioned, my hair is thin and this one actually stimulates hair growth. I have actually done a full review on Alchemy hair oil which you can read here. I am so happy I found Noughty hair care. The whole concept and design reminds me of the hair company Naked which went out of line a few years ago. 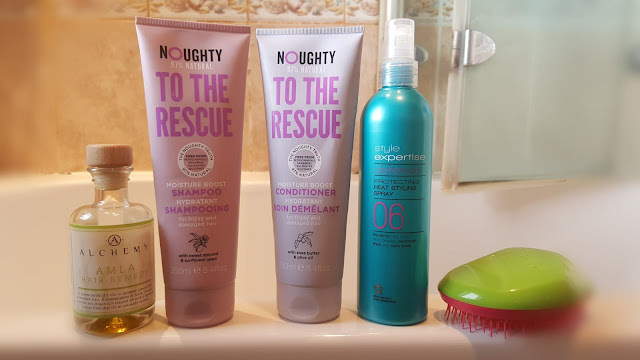 I have tried many brands of hair care both high end and budget and Noughty has to be my favourite and best of all, it's budget friendly. I picked the To The Rescue shampoo and conditioner up when they were on offer at Superdrug. I think they came to around £6 in total which was a real bargain. Noughty products are 97% natural without any nasty petrochemicals, parabens, sulphates or silicones and of course, not tested on animals. I adore the smell of these. Who doesn't want tropical creamy coconut smelling hair? The scent lingers too which is great when you take your hair down after a long day working. My hair is always so soft and shiny. I have already converted one uni friend to this brand. I want to try their one for normal hair next when I see it in Superdrug again. After I have washed and towel dried my hair, I spritz this all over and use my Tangle Teezer to spread it through before blowdrying. Unfortunately it smells quite alcoholic. It would be so much better with a nice fragrance. Luckily the smell does not linger in your hair and I feel it does a pretty darn good job at protecting it from the heat my 15+ year old hairdryer puffs out. It just proves that you do not need to spend all your hard earned $$$ to look after your locks. Why did I not buy one of these sooner?!?! All the things you have read about Tangle Teezer are true. My hair gets horribly knotty and the only way to stop the knots is to get inches cut off my hair. Seriously. I've tried everything. Whilst I've accepted my hair is just knotty, Tangle Teezer is a gentle way to brush my hair without any tugging or pain. I love it and use it every day! I really want to try out their hair styling range in the future but meanwhile their original brush does the job wonderfully. Overall I'm pretty happy with my current routine. It never varies much and I enjoy having lemon and coconut smelling hair. Once a month I may smear my head in coconut oil and leave on over night as a deeply nourishing mask but other than that, the above is it. What is your hair care routine like? What are your favourite cruelty-free hair products? I'm gonna have to buy that tangle teaser! I love it. You can buy it online or in most Superdrug stores. You have some great products here, and love that they are cruelty free! Thanks for sharing! Thank you. I think these products are amazing. Definitely staples here. Tangle teasers are amazing right? I love coconut too especially when mixed with pineapple. I love this post! 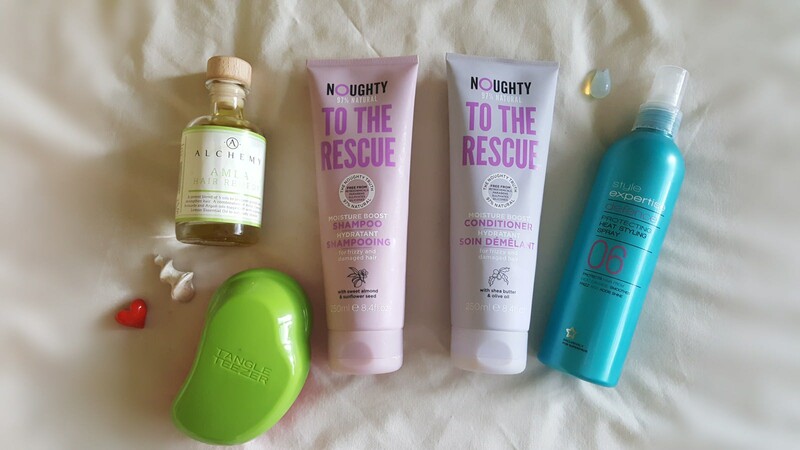 I've been using a lot more products from Lush, The Body Shop and other ethical cosmetics company recently and I can't wait to try out some of these brands for hair care! Superdrug do loads of cruelty free products and so does the lovelula online store. Worth checking out. I adore Lush.